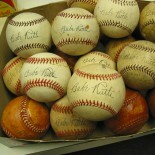 Our experts are always on hand to speak to you personally about your rare memorabilia and sports collections. Are you ready to sell? Do you need assistance as to the authenticity or to the worth of your collection? Just give us a call and we will be happy to have one of our acquisition specialists work with you personally. Contact us today at BidBuyAmi@gmail.com or call 888-308-9714. This entry was posted on August 26, 2013 by Memorabilia.Expert BidAMI in Authentication Tips and tagged Auction, Autograph, Memorabilia, Shopping, Sports.